SAUTÉ vegetables in a bit of oil in a large frypan until soft. COMBINE eggs, spinach, and cheeses. SPREAD 1/4 of the sauce on bottom of 13 x 9 in. (33 x 23 cm) baking dish. 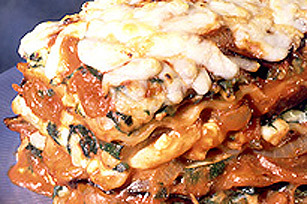 Arrange 5 oven-ready lasagne noodles over sauce. Spread 1/3 of cheese mixture over noodles. Repeat layers twice ending with sauce. Top with additional cheese.